It was an overcast morning that promised to let the sun break through later. Sixteen tandemists mounted 8 gleaming machines. We aimed them in a northerly direction and crossed the A20 and proceeded to Aylesford, where we crossed the Medway by means of the old stone bridge then turned left and started one of the many climbs up through Eccles. We passed through some lovely countryside which was still shrouded in mist but Liz & Mark, the ride leaders, took the opportunity of stopping at a view point to explain to the assembled peleton what a stunning sight they were missing. We then continued to Rochester where we viewed the castle and cathedral before enjoying tea and cakes at Goldings Tea Rooms. After tea we remounted and rode up a rather steep hill out of the city, took the cycle path back over the Medway River. The route then took us onto small country lanes which went generally in an upward direction, at least until we reached the top of the North Downs. But you know what they say “every up hill leads to a down hill” so very soon we swept down a curvy Holly Hill reaching maximum speed of 44mph. Those in the rear of the bunch had the added entertainment value of watching Clem & Caroline “Burn Rubber” as Clem did a hand brake turn at speed, it sounded like he had a piglet squealing but he assures us it was the rear brakes and not himself!, no harm done though, we all rolled into the Duke of Wellington Pub at Ryarsh, where we were met by Ernie & Betty for a well deserved lunch. After lunch we were all pleasantly surprised to see that the sun had at last decided to join us. We only had another 10 miles left, with of course a few more hills. Tea and cakes awaited us back at Liz & Mark’s home after a total of 33 hilly miles. meet 10.30am at Kings Wood, Challock - car park signed off the A251 Ashford to Faversham Road, south of Challock - for a family walk of approx. 1.5 miles. Retire to The George Inn, Molash (A252 Canterbury Road for roast dinner or other pub fayre, plus children's menu. Please telephone by 18th April if you wish to join us. 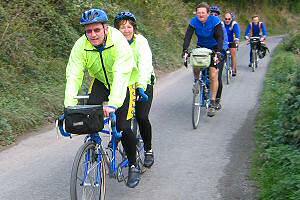 Contact: Julie & Robert - 01622 859359.
meet 9.45 for 10am start, at Ide Hill. Nearest Railway Station Sevenoaks. Ride distance approx. 40 miles. 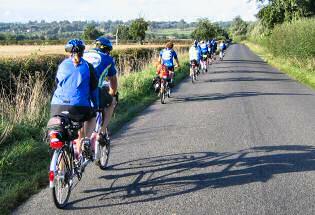 This was one of those sunny and warm spring days that make cycling really enjoyable. 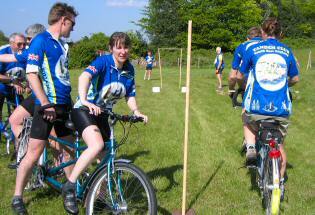 Twenty two riders took part on eleven tandems. Starting, as we were, from Ide Hill the ride was likely to be hilly and our leaders, Cliff and Pauline, didn't disappoint us! We headed off in a northerly direction, crossing the A25 in Brasted, and then took an easterly route along the Pilgrims' Way and then passing through Shoreham to Lullingstone where we stopped at the Visitors' Centre for coffee. Following coffee, we circled around to the east and south and after several more climbs and descents arrived at the Bucks Head pub in Godden Green for lunch. The return trip took us to the south and west of Sevenoaks and then northwards via the steepest hills of the day to Sevenoaks Weald and Goathurst Common and back to the start at Ide Hill. 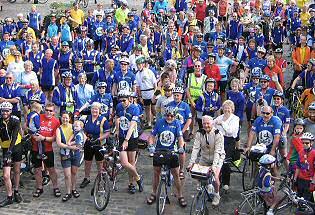 Once back at the start in Ide Hill we set about some trial runs on the 'Tandem Games' planned for the forthcoming National Tandem Rally to be held in Sandwich, Kent and organized by most of the personnel taking part in this ride. The 'games' testing worked out well and highlighted some points which needed adjustment for the rally but proved to be an entertaining way to finish a club ride particularly as the games were also followed by tea and cakes supplied by our leaders. We finished the day with the final Committee Meeting prior to the rally. 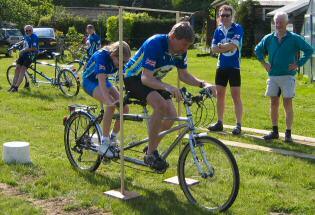 Tandem 2005, the UK's National Tandem Rally will take place in Sandwich. 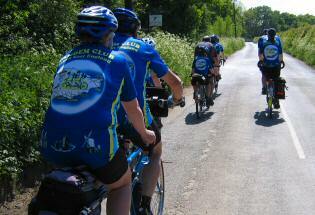 For more details, look at the Tandem Club UK web site. 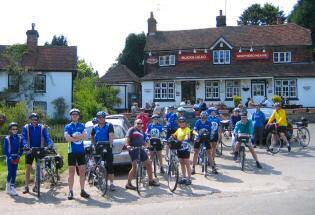 meet 9.15 for 9.30am start, at Headcorn. Nearest Railway Station Headcorn. Ride distance approx. 40 miles. 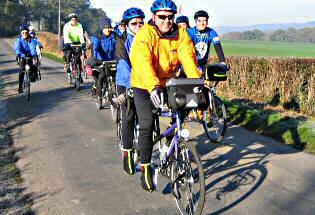 Ernie & Betty led this joint SEL and Kent ride from Headcorn, Kent and achieved an excellent turn out from all 3 South East England regions (Surrey & Sussex being the third) making a total of 21 people on 10 tandems and 1 solo. Unfortunately the morning's weather quickly deteriorated and we arrived at Great Chart Golf Club extremely wet: the hand driers in the toilets were utilised for drying purposes and even some golfing towels were purchased to remove the worst of the wet: coffee warmed us up and by the time we left, the rain had stopped and for our next leg we were able to better enjoy the little lanes and views before arriving at the Red Lion in Biddenden. The sun even came out for us for our afternoon's riding and after a stop at High Grove garden centre for tea we finally returned to Headcorn after cycling 43 miles. 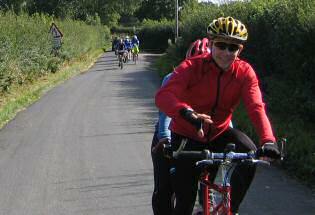 For more pictures from this ride go to the South East London website. meet 9.45 for 10.00am start. 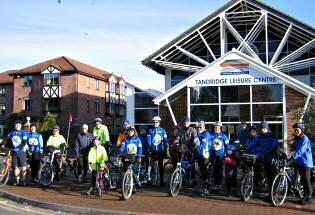 South East London and Kent regions joined together for this ride on a nice bright sunny morning at Sandling near Maidstone. 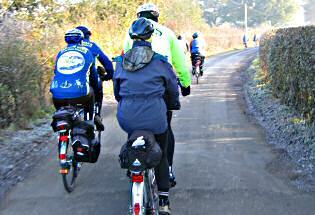 Six tandems all headed for the steep climb up towards the North Downs, along a narrow bridleway. At this point Ruth said she wasn’t feeling well (the effects of giving blood the day before) so she, and captain Andy, turned back. 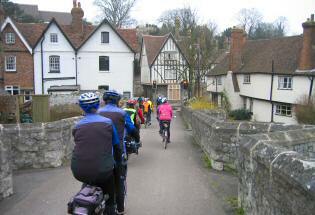 We continued along the Pilgrims' Way, towards Detling and across Jade’s Bridge. 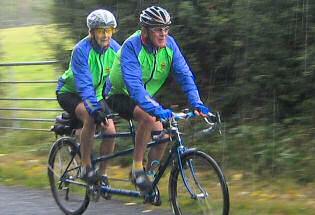 At which point our leaders fell off their tandem on deep gravel. 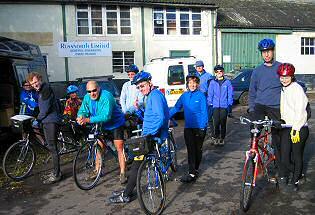 Just as well the coffee stop wasn’t too far away at the local stables. 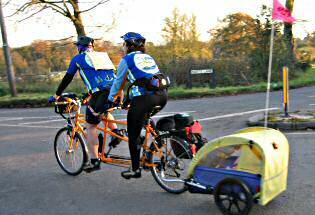 But before that we had to negotiate runners on the Maidstone ½ marathon travelling towards us. After the bacon sandwiches were consumed, we headed for the leafy narrow lanes and hills that Peter and Sally had found for us to climb. 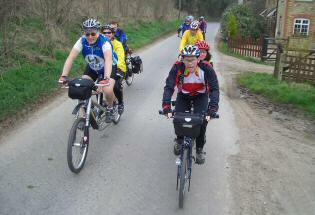 As we headed for Doddington we had a puncture on a steep hill. Having fixed this, it was then on to Newnham for a wonderful lunch. We travelled back much of the outward route. But it looked different with the Sun going down ahead of us. What a lovely autumn day, the peace disturbed by the clatter of Neville's rear mudguard falling off. This soon got tied on to the bag and we headed for the cars. 33 miles completed just before a brief shower of rain. meet 9.45 for 10am start. Twenty one of us congregated in the Leisure Centre car park in Oxted on an amazingly cold (0 degrees C) but very bright morning. Rob & Hilary, towing little Ellie (in her buggy), led us up and down and around some lovely little lanes to arrive, with glowing faces & feet!, at their cottage for coffee with buns & cakes. They finally persuaded us all out into the cold again to travel yet more lanes to arrive at the Red Barn pub in Lingfield for lunch. The 3 children had a good play in both the indoor and outdoor play areas & then we were off again to make our way back to their cottage for tea and yet more cakes, only losing 1 tandem couple who felt they should get back home & forfeit the cakes. 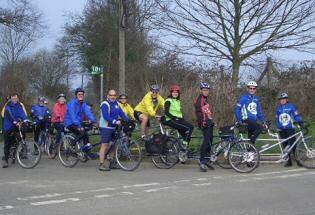 To finish the ride off Rob valiantly led us back to Oxted to complete 32 miles and an excellent day out.